Growing up as a 90’s kid, playing the computer game “The Oregon Trail” was literally all fun and games. You didn't quite comprehend the stakes and reality when one of your party would die. You kept on wagoning along. But the reality of the westward journey that the game was based on had its horrors. Just ask the Donner Party. In AntiMatter's sensational The Tower, the audience is thrust into an immersive experience where the ghosts of the past haunt Donner Lake as their horror story is told in a visceral way. For those needing a bit of backstory, The Donner Party was a group of American pioneers who set out West for California in a wagon train. After a series of mishaps, the party became snowbound in the Sierra Nevada. And for some, the only way to survive was to resort to cannibalism. This spectacularly horrific tragedy was the premise for Adam Scott Mazer’s The Tower. Staged and transformed at HERE Arts Center, The Tower is an immersive extravaganza where you and your friends will enter present-day Donner Lake, home of the horrific acts, as the past is thrust into the present. You get to witness some of the Donner Party’s greatest players including James and Margret Reed, Tamzene Donner, and Lewis Keseberg as they chose to embark on a relief effort or stay back at camp where their demise was imminent. Here's the way the night is set up: you are encouraged to explore the snow-dusted campgrounds of Donner Lake as The Guide retells the history of the events. Throughout the tour, you can move around, if you so please, to get a better glimpse of the real-live action taking place. But be warned, if there is an actor bulleting in your path, it’s best to get out of their way. These people are out for blood. With dozens of characters unable to make it into the theatrical retelling, Mazer gives you the hits of the Donner Party while blending a psychedelic allure of insanity into the mix. You watch as the migrants settle into despair and lose themselves and their trust of sanity. What Mazer, director Philip Gates, and their incredible design team do is allow you to choose your experience. With various playing “stages” set up for the scenes, you decide how close to the action you want to be. Journey plays tend to be a hard to sell on stage. But in this atmosphere, the journey is happening all around you. It’s almost a full-five senses experience. In the next iteration, because this show will most certainly have more lives, it would be even more exciting to get more of a smell and taste to enhance the experience. Just imagine what it could be like to smell the pine of Donner Lake and taste a little bit of beef jerky as the Donner Party chews one of their own. Regardless of what could be, what is present it worth every penny. With only two hours to play and so much time to span, Mazer has no time for character development. Yet it didn’t seem to matter in this environment. It’s best to know some history before going in. Even knowing little about the people, it was the fight and determination that kept those characters and this piece flowing as it was perpetually snowing. And the ensemble did a tremendous job with their treacherous journey. It was truly an ensemble effort. To guide the audience through Donner Lake, Joe Petersen as The Guide brought the typical tour guide scripted cadence. When things took a twist and his guide persona was ripped away, Petersen had true grit. 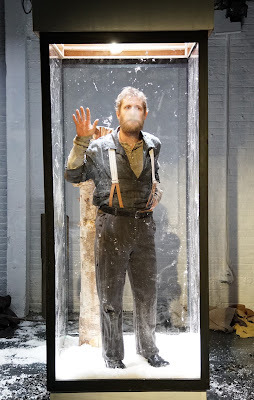 As the adventurous travelers who went forth for help, Karsten Otto as William Eddy, Leah Walsh as Margret Reed, Marlowe Holden as Sarah Foster, Craig Mungavin as Charles Stanton, and Rebecca Hirota as Luisa were forced into them to physically freeze in the elements. With the audience potentially in their face, each actor needed to go above and beyond to make the theater feel like a frozen tundra. And they did just that. They used every inch of their body, offering a teeth-chattering vocal. You could see the amount of physical exhaustion they exuded. Individually, it was Leah Walsh ‘s Margret that shattered hearts. While she may not have been as sugary, Marlowe Holden’s Sarah was a warrior. As the tent and cabin-bound stragglers, Elizabeth Bays as Virginia Reed, Curry Whitmire as Landrum Murphy, and Courtney Fenwick as Tamzene Donner were able to capture the more comical moments of Mazer’s text. Bays and Whitmire as the meet-cute home alone kids had a special bond. When the fantastical moments are brought into the play, it’s Fenwick who delivers the fear. Between the contacts and the meat market scene, Fenwick may haunt your dreams. Leave it to the true outcast of the tale to be one of the most intriguing characters. Rudi Utter’s Lewis Keseberg, the last remaining Donner Party member and self-proclaimed King of the Meat was filled with fervor. His character’s journey may be one of the strongest in the text which allowed Utter to elevate him to a brilliant force. It takes a revolutionary vision to make The Tower come to life. Director Philip Gates had just that. Gates and his concrete design team reimagined how to transform a common theater space. Scenic designer Peiyi Wong’s unparalleled design transported the audience through time and space. With virtually four “stages” for Gates to play in, Wong paid attention to detail, providing intricate detail without overstuffing the space. The subtleties, between the wood features to the forests-scape on all surfaces, Wong transformed HERE Arts Center into something you wish would never change. 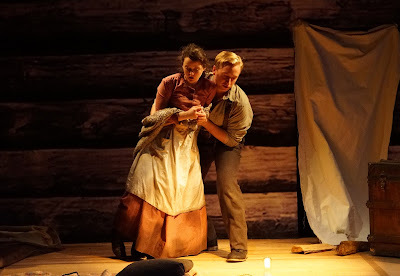 The lighting design by Alana Jacoby was precise and sharp as it bouced from scene to scene, but when the travelers were in the wilderness, the cold light was perfectly terrifying. The costumes from Summer Lee Jack fit the period well. Even though they were layered, you could see how the thin fabrics lead to their demise. The hero of the design team was Sam Kusnetz. Kusnetz played double duty as sound and projection designer. He was the defining factor in bringing the audience to Donner Lake. In a time where sound design isn’t getting the recognition it deserves from a certain award show. The soundscape Kusnetz gives The Tower is essential for allowing you to feel present. The wind alone was splendid. When it comes to Kusnetz’s projection design, it was something noteworthy. From the movement of the clouds to the incidental films, Kusnetz filled the room in every way possible. With such brilliant collaborators to work with, Gates seemed to have every wish he ever desired at his disposal. His staging was deliberate and offered an easy flow for the show. When he did go for the element of surprise, depending on where you were in the space, you might have had a moment of fear in your eyes. Though the end was horrific for the Donners, the future is bright for The Tower. There’s something about the intimate yet vast space that made this experience worthwhile. Keep an eye out for the next iteration of The Tower. And hope you get the five-senses version. Cannibalism has never been so exciting.